The Tunnels were alive with spirits. You could say they nearly whispered into the sleeping ears of the folks Below. What were those talents? Who needed things shot with arrows? Jamie sat at the sentry point listening to the late night pipe chatter. The chatter had been over a heaping basket of fabric and wool yarn that Catherine had brought down for Mary and Olivia. Jamie shook her head, imagining the creations they fashioned, as she worked the leather thongs into a chain. Suddenly, she realized she had absent-mindedly crocheted a chain with her bare fingers. Footsteps approached. Vincent’s graceful, long stride accompanied Catherine’s many steps to keep alongside him. Tonight, they were hip to hip, his golden head leaning to catch the warmth of Catherine’s words. Vincent faced her and took both her small hands in his. Jamie didn’t want to watch, yet, she was constantly drawn to the beauty of these very different people together, so much in love. Of course Catherine could have simply viewed the multicolored ribbing, but her hands fell on his muscled forearms, enjoying his underlying strength as well as the wool’s softness. There was an extended silence between them that ended with Catherine’s sigh. Vincent dropped his face toward her. “Catherine, are you enjoying yourself?” and her hands locked around his forearm. She blushed in the tunnel shadows and turned away, slowly moistening her lips before she raised her face to his . “Love, it’s been almost three days since I’ve seen these muscled arms; I actually am enjoying myself.” The spirits within the Tunnels saw them, one silhouette, and knew they were two hearts joined in one love. Jamie turned away, these moments too private to invade. That was it, though … Mary never did anything for herself! It was Mary who hugged tears away, Mary who stitched ragged sock dolls. Mary was everyone’s Mother. Jamie would figure out how to make something for Mary. She would find a way to get some of that ‘Autumn’ colored wool! Within the next twenty-four hours Jamie passed a message through Bennie. Her plan unfolded by trading a few small amethyst crystals for balls of the variegated yarn. Then Jamie bartered with Olivia. “Would you trade some wooden blocks for your boys in exchange for some knitting lessons?” Jamie didn’t know if the boys needed the blocks that badly or if Olivia found humor in the trade. Nights passed, and Jamie was relieved she wouldn’t be knitting with old arrows. Olivia discretely carried her needlework bag past Mary’s chamber directly to sit with Jamie, patiently teaching Jamie to read and follow what she called ‘annoying’ abbreviations. When the Wrist-Warmers were done, the spirit of the Tunnels smiled. Jamie sat back almost too excited to wrap them; but she did, and she actually managed to keep her mouth shut until the afternoon of Winterfest. Clutching the package to her breast, Jamie slipped silently, with her head down, toward Mary’s chamber. She hung a few steps back, listening to Mary’s gentle, tuneless humming with the older woman’s movements. Jamie listened to her opening and closing drawers, the sounds of paper being smoothed and refolded, the ‘rrrrrrrrrr’ of ribbon being tied into bows. Jamie couldn’t contain her excitement. She made a scuffling sound and headed toward the doorway. Without turning Mary cheerfully greeted her, “Jamie, I can always tell your determined gait. Come in, dear.” The matriarch turned as she finger-combed a few wild hairs away from her face. “Something up?” Mary did like a reason to pour a cup and visit. Jamie stammered, "It was about time." Keeping her cheeks full of tea, she nodded with a conspiratorial grin. Imagine Vincent asking Catherine a very important question. Was it the one she expected? “Tonight? He’s going to ask her to move below --- with him?” Jamie felt the package shift within her vest. “I believe he’s couching it a bit differently. God forbid Father would think they would ‘shack-up’! Do people still say ‘shack up’?” Mary’s sense of humor glimmered in her eyes. “Vincent has Margaret’s ring and Father’s blessing for this proposal.” The two women sat for a second thinking about Vincent and Catherine’s love culminating in their joining. Gently placing the cup on the tea tray, Jamie spoke up, “You’re always showing the ways you love us, Mary, and that love, it’s ... it’s so great, some of us want to work hard to justify it.” As she spoke, she withdrew the brown paper package and found herself engulfed in Mary’s hug before she could place it into her hands. “Oh, dear, oh, dear, Jamie–“ Mary joined her on the large hassock. “You never have to justify love. Below, living the belief that everyone is, at heart, good, how can I not mother every one of you?” Jamie placed her gift in Mary’s lap. “For me?” With a nod, Mary slipped the package open. Her eyes watered as her experienced gaze took in this novice’s finished project, complete with irregular gauging. Mary recognized the pattern. It was one she had made nearly in her sleep before she passed the booklet to Olivia. She recognized it as the same yarn Catherine had brought. Mary realized the great lengths Jamie had taken to make this gift, and it earned a place deep within her heart. Once again Mary embraced Jamie, and together their eyes watered at the moment’s sentiments. Breaking away from their tearful embrace, Mary smiled at the tunnel tomboy dressed tonight in her best culottes. Jamie’s eyes brightened as she received a similarly sized package. 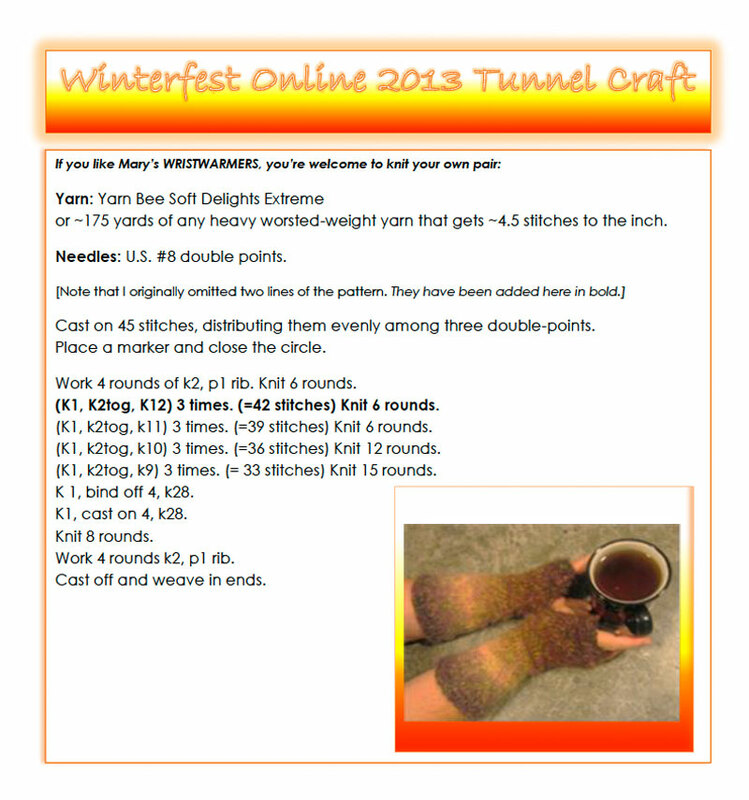 Untying the twine her grin grew wide, there in the paper were wrist-warmers in the identical ‘Autumn’ colored wool. These were intricately executed with a lacey, crocheted edge at the palm and the forearm. Jamie worried her bottom lip at the similar gift. Jamie trembled to hold the finely stitched apparel up in the lamp light. The warm ochers and olives shimmered in the golden lamplight, and they were so soft, so warm. 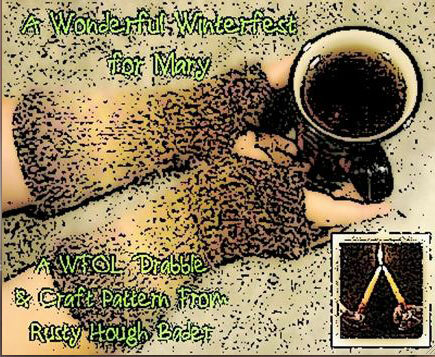 “Why don’t we wear these tonight?” Mary queried, while Jamie still marveled at the exquisite hand Mary had in her knitting. Stripping off their usual fingerless gloves, they slid into their gifts and linked arms to join their Tunnel family. They were two very different women, striking examples of the range of capable and caring citizens Below.